In Wisconsin legislators who live outside Dane County get a per diem of $88 a day when they travel to Madison for work (inside Dane Co. legislators get $44/day). If Hopper claimed the outside Dane County per diems when he was, in fact, living inside Dane County, now we're talking about possible embezzlement charges. This would probably make him subject to Dane County prosecution. If that's the case, he should be investigated by the Dane County DA. Alright, this post was inspired by a painful conversation Zach is having with a troll over at Blogging Blue, so let's go through some of the residency issues associated with Randy Hopper's displacement. Evidently, he no longer lives where his state web site says he lives. That's a problem. Now, since he's going through a divorce and houses are usually contentiously disputed items between parties, there's a possibility that Hopper still owns part or all of his home and pays property taxes on the residency. Fair enough, but he wouldn't be the first legislator to own two residencies. His predecessor in the 18th district, Carol Roessler had homes in Oshkosh and Waukau, for example (and towards the end of her tenure in the senate she was criticized for spending more time outside the district than in it), so it could be an issue of determining what Hopper's "primary" residence is. One of the ways of determining this would be to compare the number of nights he's spent in Fondy to the number of nights he's been in Madison. Presumably Hopper didn't stick around Fondy after he filed for divorce on August 18th of last year and there's a possibility that he's been crashing in Madison every since. 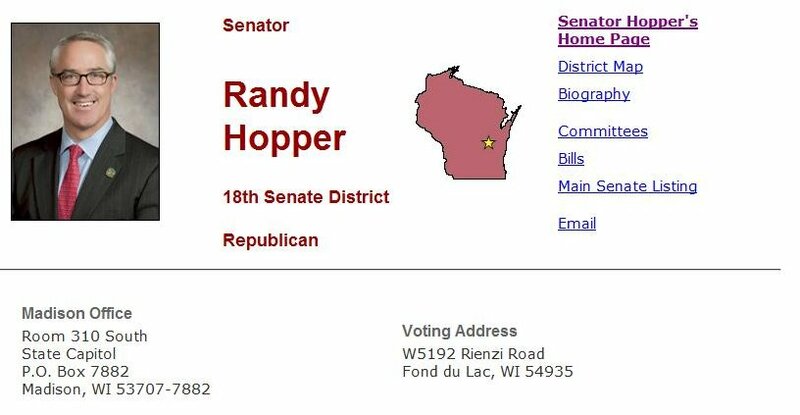 If that's the case, then Hopper is a Madison resident when it comes to voting. In fact, if Hopper lived in Madison between August 18th and the November 2nd election, yet returned to Fond du Lac to vote during the midterm election, he may have committed voter fraud. Voting laws in Wisconsin require people to vote at the polling place for where they have been living for 10 days prior to the election (that's the extremely short version of the law). If Hopper was essentially living with his girlfriend during that time then his proper polling place should have been in Madison. Now we have to ask ourselves what constituents "living," which isn't an easy question to answer under the circumstances. Did Hopper plan on returning to Fond du Lac? If so, did he make an effort to find another residence in the district? When? How often? How many nights did he spend in Fondy? How many in Madison? Did he co-sign the lease with his mistress when they moved in together? Has he payed part or all of the rent of his Madison residence? What about the phone bill for a land line? Does he rent a parking space in Madison? These may seem like trivial questions but they will now have to be asked to determine a pattern of living that should dictate where Hopper should have voted during the last election. Right now there's a very good case to be made that Hopper is a Madison resident, has been for the last 6-7 months, and was on November 2nd of last year. If he voted in Fond du Lac, he may have committed voter fraud. It's entirely possible he committed voter fraud unintentionally, but he still broke the law. There's a very similar case involving an elected official in Indiana moving through the courts as we speak. So this is now a job for an aggressive an inquisitive media. Milwaukee Journal-Sentinel, Cap Times, State Journal, Oshkosh Northwestern, Fond du Lac Reporter -- this is your time to shine. Again, it's entirely possible that Hopper didn't do anything illegal. Hell, he may not have even voted in last year's election at all, but if he did, he sure as hell better have done it properly. "Senator Johnson has this completely backwards." "The Facts Will Set You Free"
Hey, You Know What's a Great Idea?